This is a used laptop. What you see in photos is exactly what you get. 4GB 800MHz DDR2 SDRAM (maximum capacity 8GB). 500 GB HDD. Dell Wireless WiFi 1510 (802.11a/g/n). 8x DVD ( /-R double layer) drive. Weight: 8lbs 15oz. AC Adapter: Dell's Compatible AC adapter. Windows 7 Professional 64-bit with SP1 and Windows Updates. • Fresh Windows 7 PRO 64 bit with applicable updates installed. LCD screen, keyboard, touchpad, and palm rest look nice and clean with no cracks, scratches, or cut. Sony Vaio VGN-CR131E (PCG-5G3L). HARD DRIVE OPTICAL DRIVE You will receive the unit pictured. Windows 10 Professional 64-bit installed. 1 MagicGate. 1 Ethernet. All ports were tested. ITRONIX VR-2 (GENERAL DYNAMICS). The General Dynamics Itronix VR-2 is an advanced vehicle-rugged notebook computer with excellent performance and a number of features the competition will find hard to match. Up for sales is used lenovo thinkpad T60 laptop core 2 duo cpu tested and working. -Screen Resolution:1400 by 1050. This would be a good assets for a lenovo collector. What you see is what you will receive. Lenovo T400 in good condition. A real work horse. Please see the photos for all the specs. Win 10 with key. Webcam, Bluetooth, finger recognition. With Docking station and original adopter. Works amazingly fast and good. There is a minor break in the corner. Please see all the pictures. WiFi, Ethernet LAN Card, 15.4" Bright Display. 2GB RAM,DVD/CDRW Combo Drive. Because the Latitude D620 features a wide-aspect 16:10 display, you can easily keep multiple applications open without running short on viewing space. Lenovo ThinkPad SL400. No cracks! ThinkPad or Lenovo logo may be worn off. See pictures. HARD DRIVE OPTICAL DRIVE You will receive a unit similar to the one pictured. AC adapter included. This machine has been fully tested, and is ready to use. This machine is running a clean installation of Windows XP Professional SP3. This system will be ready to go out of the box! - 80 GB solid state drive (SSD). This machine has been fully tested, and is ready to use. A clean copy of Windows XP Professional SP3 has been installed. This system will be ready to go out of the box! -40 GB solid state drive (SSD) - 56k modem. All boot to BIOS config when connected to AC. Hard drives, hard drive caddies, and hard drive side cover panels are NOT included. AC adapters are NOT included. • 160GB HDD. This laptop works and operates like any refurbish laptop. This laptop is a used computer. This laptop was tested and functions as it should. • Win 10 Pro 32 Bit. • Optical Drive DVD/CD. This is a technician tested working, used, clean, Dell Latitude E6400 14.1" Laptop. 4GB DDR2 RAM. Dell Part #: D814C. Power Adapter. This machine has been fully tested, and is ready to use. This machine is running a clean installation of Windows XP Professional SP3. This system will be ready to go out of the box! - Windows XP Professional Edition, SP3. 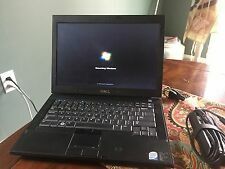 Refurbished Dell Latitude E6420 Laptop w/ HDMI Port. Genuine Dell Adapter included. Product TypeStandard Laptop Computers. Fresh Install of Windows 10 Professional Installed. Port (RS232 Port), Modem RJ-11. • Protect your laptop from counterfeit software that can expose users to security risks. Dell D620-D630. Genuine Microsoft Windows software preinstalled and Certificate of Authenticity verified with Microsoft. SAVE! New Windows 10 + Microsoft Office + NEW Battery! Dell D620 / D630 Laptop Computer. Model: Latitude D620 or D630. 160GB HDD and With 4GB RAM! 4GB RAM Installed. Network: Wi-Fi, Ethernet, Modem. Ports: 3 x USB, 1x Ethernet, 1x Modem, 1x VGA, 1x Headphone, 1x Microphone, 1x Serial, 1x PC Card, 1x Smart Card Reader. Fully refurbished and ready for use. Lenovo t400s. Possessor : SP9400@ 2.40GHz. Hard drive : 256ssd. Core 2 Duo T7800 2.6ghz. Nvidia Quadro FX 570M. 320gb Hard Drive. Laptop is in fair condition overall. Top is slightly discolored where there were decals on it at one point. There is a crack in the plastic bezel surrounding the screen (top left corner) but nothing that affects use. WINDOWS 7 PRO 64 BIT : NEW 500 GB SOLID STATE DRIVE : DVD/CD RW DRIVES : BLUETOOTH : 4 GB RAM : OPEN OFFICE 4.1.5 : EXCELLENT CONDITION : GREAT SCREEN : 2 RED KEY BOARD LIGHTS : NEW 9 CELL BATTERY OR A GOOD DELL 9 CELL BATTERY : NEW 90 WATT AC ADAPTER : MICROSOFT OFFICE 2013 OR 2016 PROFESSIONAL : REAR MOTHER BOARD COVER : RIGHT SIDE USB PORT COVER : 4 USB PORTS : WIFI. 1x Ethernet (RJ45) 1GB Network Port(s), 9 pin Serial Com Port (RS232 Port), Modem RJ-11. Original XP drive and Windows 10 Drive. Takes about 10 seconds to change the drive. 80GB Hard Drive Windows XP. BIOS is UNLOCKED ! Tested to power on only. Screen works fine. Our Standards. We are a team of experts who are flexible, attentive, and responsive. NurTech Technology, LLC, was established in 2006. About NurTech Technology! Our Warranty Policy. •Webcam Fingerprint Reader. •Moonlight White. • HP Integrated HDTV Hybrid Tuner. • HP Color Matching Keyboard. Color: Moon White. •Blu-Ray ROM with SuperMulti DVD /-R/RW Double Layer. Dell LATITUDE E5400. 14" LCD Display // Wi-Fi // Card Reader // DVD±R/RW // 80GB HDD. Item described to the best of my knowledge. T ha nks for look ing ! No accessories are included with the notebook unless otherwise listed. Tested to the best of our ability. Shows signs of normal use. We endeavor to provide otherwise high cost parts at decent wholesale prices. Dell 14.1in. (500GB, Core 2 Duo, 2.26GHz, 4GB) Notebook - E6400C2D226FB2R. CORE 2 Duo. Product Key Features. TouchPad, Keyboard. Optical Drive Type. Hard Drive Capacity. Hard Drive.